When you live at the Alexan CityCentre, you discover luxury apartments in Houston where beauty is more than skin deep. Dive into a lifestyle where apartment features aren’t just beautiful, but make your life easier. Here you can enjoy a world designed around you, and a life filled with fun and friends. Indulge your friends and out of town guests with a suite of community amenities that are perfect for a 3-day weekend. You can rest easy knowing you picked the layout and floorplan perfect for the life you want. Your new surrounding neighborhood has plenty of things to offer. Treat yourself and your friends to dining, entertainment and social venues that will keep you coming back for another good time. Every great party ends up in the kitchen. With a new gourmet kitchen like yours, that is always a good thing. You can always start the party early by serving perfectly chilled wine from your wine refrigerator. Show some razzle-dazzle as you do your prep on your polished countertops. They will be either granite, marble or quartz, depending on the perfect floorplan you choose. You can let your friends in on the act to help you prep as you fire up the gas range. Pull your pots, pans, and plates from 42” cabinetry when it is time to serve. Your gas range isn’t the only thing you can fire up. With a Sonos technology package, you can fire up the beats as everyone dances the night away on your stained concrete floors. Nobody will mind helping clean up when you have stainless steel appliances for helpers. When your friends leave and you are ready to relax, your stand-alone shower is hot enough to relax it all away. 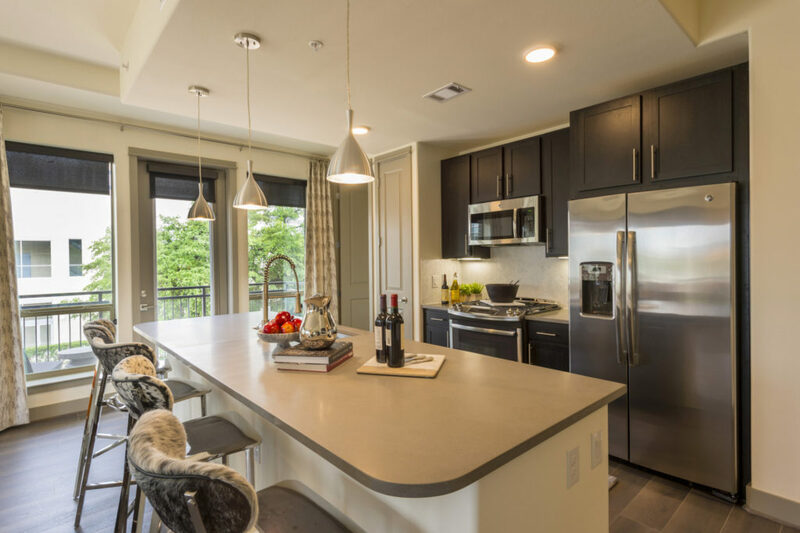 Discover a beauty more than skin deep when you choose your new luxury apartment at the Alexan CityCentre in Houston Texas.